Do you do a cake? Or do you make it? Learners are often not sure when to use “make” and when to use “do”. What about you? Test yourself with the exercise below. If you’d like to start with a short overview of the difference between “make” and “do”, click on the box below. ● I’m just making coffee. Would you like some? ● We no longer do business with that company. ● Who does the cooking in your family? Both “make” and “do” are used in a lot of fixed phrases that simply have to be learned. Diese Übung stammt aus dem Übungsheft Business Spotlight Plus 5/2018. Die ganze Ausgabe können Sie in unserem Shop bestellen. 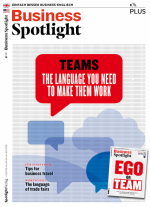 In Verbindung mit dem Magazin Business Spotlight gibt es das Übungsheft auch günstig und bequem im Abo.